I have referred to this moth as "him" but not only may it be "her" it could even be "him and her" as apparently "Gynandromorphs" (half male, half female) are common in this species. 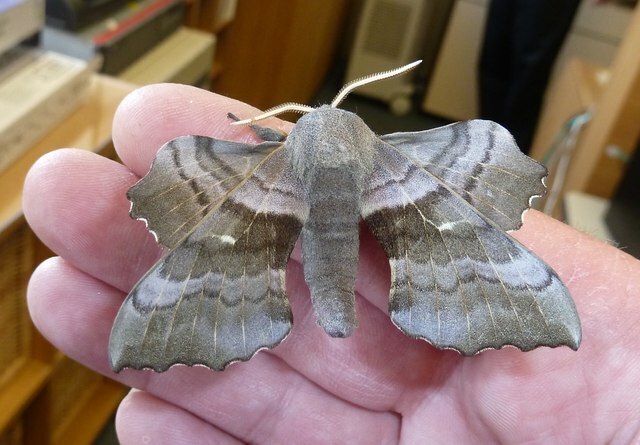 The Poplar Hawkmoth (Laothoe populi) is a member of the Sphingidae family of hawkmoths that include a number of conspicuously large and/or strikingly marked moths. In the imago (adult) stage, the moth does not feed as its proboscis is non-functioning; its sole purpose being to breed and lay eggs to perpetuate the species. This species may be male, female or both male and female, a form known as a "Gynandromorph". This page has been viewed about 793 times.